Yes, we did eat last week even though there was no plan. It would have been silly for me to even pretend that there would be a hint of a plan...an inkling of a plan...or even a faint glimmer of a plan in the distance - it just wasn't going to happen. We finally finished all of the various Christmases yesterday...the day after our annual Come & Go party...I love the holiday season but am always glad to get back-to-normal. This month I am trying out a slightly different way of menu planning. I have worked out a menu for the month off of the items I have in the freezer and pantry. I probably will still have to buy a few things here and there and of course, there is always the mystery of what will be in each week's CSA basket, but for the most part, we should be covered. To make things a little interesting, I am using Rachael Ray's 30 Minute Meals & 30 Minute Meals 2 all month long. 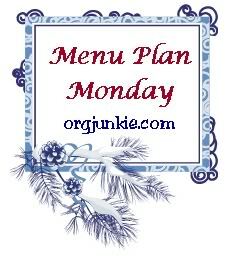 This is part of the wonder that is Menu Plan Monday over at Organizing Junkie.